Our federal government offers help with paying for your Part D drug plan expenses if you qualify based on income. This is called the Low-Income Subsidy. Anyone can apply for this at Social Security at any time, but help is awarded based on proving low-income and limited resources. You must have an annual income that falls below 150% of the Federal Poverty Level based on your household size. Beneficiaries who qualify will receive assistance with paying their monthly Part D premiums, their annual Part D deductible, and also their co-payments for retail medications. There are different levels of qualification, and the subsidy level generally determines how much assistance you will get with premiums. Someone qualifying a full subsidy would have 100% of their Part D premium paid for, up to the benchmark allowed by Medicare for that year. For example, if you get an award notice that says you have a full subsidy, and the benchmark for the year is $34, then you can choose any drug plan you like, and the LIS program will pay up to $34/month toward your premiums. Choosing a drug plan with a premium of $34 or less in that scenario would mean you pay nothing for your drug plan. Furthermore, you will pay no deductible if your plan has one, and your copays for medications are greatly reduced. If you think you may qualify, it is worth contacting Social Security for an application. Also, individuals enrolled in the ExtraHelp program do not have a gap in prescription drug coverage, also known as the coverage gap, or the Medicare "donut hole." The amount of subsidy depends on the individual's income compared to the Federal Poverty Level and resource limitations set by the Social Security Act. 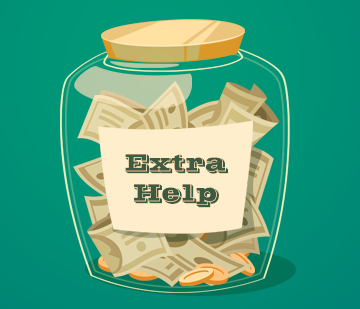 ExtraHelp is estimated to be worth about $4,000 per year on average per person enrolled in ExtraHelp, according to Social Security. Many people qualify for these important savings and don’t even know it. Our producers have helped hundreds of individual apply for ExtraHelp saving them thousands of dollars. After you apply, Social Security will review your application and send a letter to you to let you know if you qualify for Extra Help. After you qualify, you can choose a Medicare prescription drug plan. If you do not select a plan, the Centers for Medicare & Medicaid Services will do it for you. The sooner you join a plan, the sooner you begin receiving benefits. If you aren’t eligible for Extra Help, you still may be able to enroll in a Medicare prescription drug plan. After $4,950 in out of pocket drug costs, you pay $3.30/generic and $8.25/brand-name or 5% of the drug cost, whichever is greater.